Copies of newspaper clippings from the Slocum Massacre. 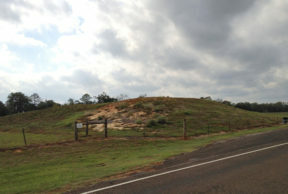 On the grassy shoulder of a rural roadway in Anderson County in East Texas now stands a Texas State Historical Marker titled “The Slocum Massacre.” The text tells the story of the 1910 deadly eruption of racial violence by the white community against the African-American settlement. Men, women and children were gunned down in those days and nights of horror. However, due to the limits of documentation, the marker is only able to list eight of the murder victims. In their memory on Saturday at the marker unveiling, a bell was rung eight times. With that, the covering over the marker was removed and years of struggle were realized. Constance Hollie-Jawaid is a descendent of Slocum – her great-grandfather was killed in the massacre. She led the fight for the marker against all the naysayers. Opposition to the Slocum Massacre historic marker came mainly from Anderson County’s elected officials and the county historic commission. County Commissioner Greg Chapin represents District 1 in Anderson County. Lincoln High School was a segregated school for African-American students. Odem says a historic marker was installed but it’s not there now. “That marker stayed there for about two years and then somebody tore it down – hauled it off,” Odem says. If anyone should wonder about the atmosphere in Slocum today about the Massacre, they need to look no further than across the street from the Slocum public school, where the pre-dedication events where being held. A brand new Confederate flag was hanging from the porch. “Why today of all days, right across from the school, would you put up a Confederate flag,” Hollie-Jawaid says. Nevertheless, the marker was approved, it was installed and it was dedicated amid laughter, tears and prayers. What happens tomorrow is anyone’s guess. But Hollie-Jawaid hopes the Remember Slocum Movement inspires other communities in Texas to reclaim their history in the face of injustice.